•Calculated from equipment measurements—various options are available: pump + tubing, pump + tubing + flowcell, etc. •Use a historical minimum purge volume stored in the database. Note: If the UseAdvancedActionLevels enumeration is set to have 'N' at the top of the list, Action Levels can be set up using the Range Checks process. If not already set up, follow the instructions found in the article titled Create Groups for Field Results Tab. To use a MAG in EDGE for field measurements, the group's Type must be set to Field. Also note that the DEFAULT_UNITS must be set. 1.In EQuIS Professional, open the Action Levels form. 2.Add an Action Level Code. 3.In the Action Level Parameters tab, add the field parameters from the Available Parameters list that will be used in EDGE (presumably including the same parameters as in the MAG set up previously). The next step will depend on which type of action level you wish to set up: Field Alerts or Stabilization Criteria (with or without Minimum Purge Volume calculations). Enter values in WARNING_LEVEL and WARNING_LEVEL_MIN fields that describe that maximum and minimum allowable values (respectively) for the parameter. Set the UNIT used for the parameter. Note: Field Alert Actions Levels' action_level_type CANNOT contain the word "purge." Note: You can set multiple Field Alert (range check) Action Levels for a given location. In this case, EDGE will combine overlapping Action Levels to compare each parameter to the most stringent range. For example, a location could be assigned to multiple criteria with varying acceptable pH ranges. 1.In the Action Level Code Details tab, set Type to an action_level_type that contains the text "purge." If needed, add the Action Level type. 2.Enter ACTION_LEVEL, UNIT and ACTION_LEVEL_NOTE to set the type of stabilization check and the associated value. The range between the highest and the lowest values for the last three measurements cannot exceed the stated limits. The range between the highest and the lowest values for the last three measurements cannot exceed the stated limits. The criteria will not apply to water levels that are rising. Overall average of readings are less than the established limit. Used for flow rate. Used with parameter representing the volume of water purged from the location. The parameter is stabilized when it exceeds minimum required purge volume (see Minimum Purge Value Criteria section (below). Note: Two criteria may be used for a given field parameter simultaneously. This is done by adding the second criterion's value and type into ACTION_LEVEL_MIN and ACTION_LEVEL_MIN_NOTE, respectively. It does not matter which criterion is placed in which of these two sets of fields. < 0.05 ft drop (no criteria for water levels that are rising) - The range between the highest and the lowest values for the last three measurements cannot exceed the stated limits. Minimum Purge Volume = 1 pump & tubing volume. Populate custom_field_5 with "Pump+Tubing". Turbidiy ± 5 NTU or ± 10%, whichever is greater and the range between the highest and the lowest values for the last three measurements cannot exceed the stated limits. 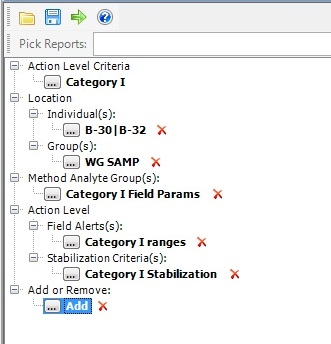 The minimum volume required is defined in DT_LOCATION_PARAMETER where param_code = "MICROPURGE_VOLUME"
The EDGE report called EDGE Setup Advanced Field Alerts and Action Levels facilitates the configuration of the new action levels. Run the report to link location(s), MAG(s) and Action Level(s) together. Already established criteria may be added later by entering the same criteria text in the Action Level Criteria and selecting new locations, MAGs or Action Levels. Recreate an EDGE Reference Value File (RVF) or reconnect to the database using EDGE's EQuIS Database Connection feature. It is also helpful to export an EDD using the EDGE Field EDD report. This EDD will push forward the needed information to link up sys_loc_codes in EDGE to MAGs and field alerts/stabilization criteria, as set up previously using the EDGE Setup Advanced Field Alerts and Action Levels report. The value is in Location_v1.alert_purge_criteria. 5.Enter field result data. When field result values are entered that trigger the field alerts or stabilization criteria, the values will be highlighted.